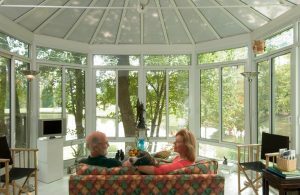 The experts at SRA Home Products proudly install sunrooms for homeowners throughout the Marlton, New Jersey, area. These products, which are crafted by the industry-leading manufacturer TEMO, allow homeowners and their families to enjoy the views of the great outdoors while remaining protected from harmful UV rays, inclement weather, annoying insects, and windblown debris. Whether you plan to use your sunroom as an exercise room, a playroom for children, a craft room, or a place to entertain guests, we can provide you with a stylish, durable product that will serve you and your family well for years to come. All of the sunrooms we install are incredibly durable thanks to their advanced TEMKOR surfacing, which allows them to withstand scratching, fading, and impact. And, for additional peace of mind, these structures are protected by TEMO’s lifetime limited transferrable warranty. We can also help to make your home improvement project more affordable, since we offer convenient financing options for qualifying customers. To learn more about the impressive features of our sunrooms, contact SRA Home Products today. We will be glad to schedule a free consultation at your Marlton, NJ, home.